Panna cotta means “cooked cream” in Italian. This simple yet elegant dessert achieves the perfect balance between decadent and light-tasting. Sprinkle the powdered gelatin over one-half-cup (120 ml) cream, whisk with a fork and let rest for five minutes to bloom. Place all of the ingredients for the panna cotta in a saucepan and heat over medium-low until almost boiling. Add the gelatin and whisk to ensure the gelatin is fully dissolved and incorporated into the cream mixture. Pour the cream mixture through a fine mesh strainer, into a glass measuring cup or a mason jar, and chill for a few minutes before pouring into six individual serving glasses. Place the panna cottas into the refrigerator to chill for at least three hours. Make the strawberry compote: place the strawberries, water, and Sola® into a large saucepan over high heat. Bring the mixture to a boil, then reduce to a low simmer and partially cover with a lid. Cook for approximately 10 minutes until two-thirds of the liquid has evaporated. Remove the pan from the heat and allow the compote to cool to room temperature. 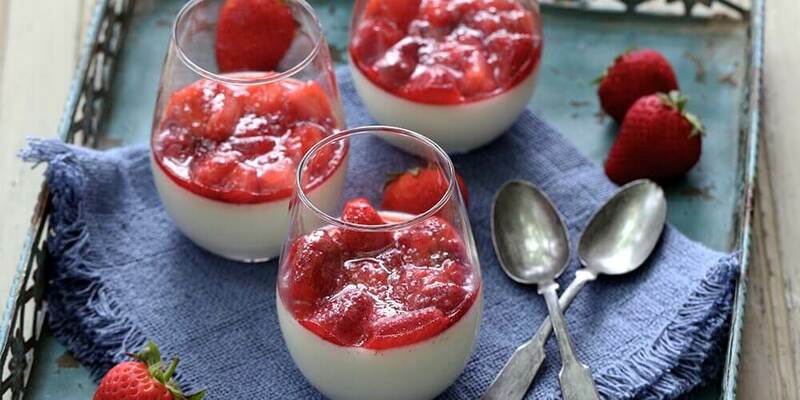 To serve the panna cottas, simply spoon the cooled strawberry compote over the set cream.